What are the main characteristics of the thyreophorans? The thyreophorans (Thyreophora, or “shield bearers”) were one of the two main Genasauria dinosaur divisions. This group was characterized by the presence of bony armor on their bodies. The thyreophorans were further subdivided based on their type of armor: The stegosaurs (Stegosauria, or “plated dinosaurs”) had armor manifested as bony plates or spines on their backs; the ankylosaurs (Ankylosauria, or “crooked or bent reptiles”) had armor as a covering, or small plates over their backs. In some classifications, there is no division between the stegosaurs and ankylosaurs. 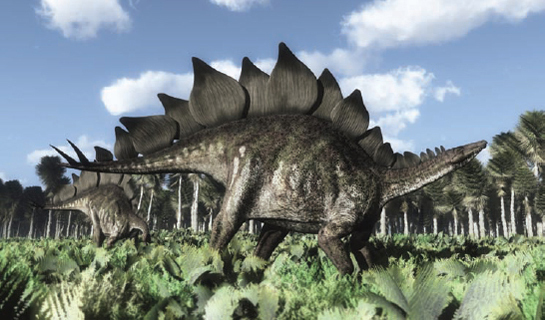 With bony armor being the main characteristic of thyreophorans, the Stegosaurus makes a perfect example of the group (iStock).